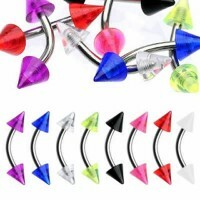 Great quality surgical steel banana / curved barbells with acrylic uv multi crystals balls. Various of gauge(thickness), length, ball sizes and colors available for vary choice. Great quality surgical steel banana / curved barbells with acrylic uv gem balls. Various of gauge(thickness), length, ball sizes and colors available for vary choice. Great quality surgical steel banana / curved barbells with glitter acrylic uv balls. Various of gauge(thickness), length, ball sizes and colors available for vary choice. Great quality surgical steel banana / curved barbells with acrylic uv balls. Various of gauge(thickness), length, ball sizes and colors available for vary choice. Great quality surgical steel banana / curved barbellss / horseshoes with acrylic uv dices. Various of gauge(thickness), length, dice sizes and colors available for vary choice. 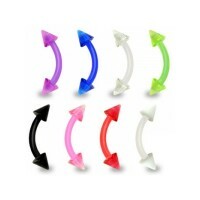 Great quality flexible bio banana / curved barbells with acrylic cones. Various of gauge(thickness), length, cone sizes and colors available for vary choice. Great quality flexible bio banana / curved barbells with acrylic balls. Various of gauge(thickness), length, ball sizes and colors available for vary choice. Great quality surgical steel banana / curved barbells with multi 5 crystals jeweled balls. Various of gauge(thickness), length, ball sizes and crystal colors available for vary choice.